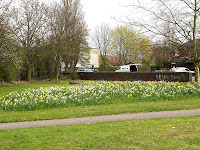 Included because of it's connection to Aldridge, this single track freight-only railway ran from near Pelsall on the South Staffs line, via Stubbers Green to Leighswood Colliery and various brickworks north of Aldridge. Not many relics now survive, as this line was also closed in the mid-1960s. 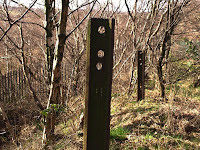 1 Sections of old bullhead rail used as fence posts, near Northywood Bridge. 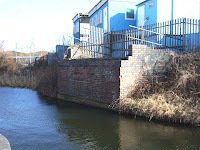 2 Until just a few years ago Barnfield Bridge over the canal was pretty much intact, but now only the abutments remain (one shown, on the Brickyard Lane side). 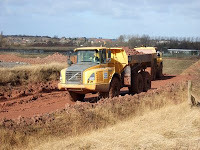 3 Stubbers Green quarry is still heavily worked for clay used in brickmaking, but virtually all traces of the branch line have now been obliterated. 4 Leighswood Branch passed under the Lichfield Road at Shelfield, only this west wall of the bridge remains, the cutting having been filled in. 5 A-Z map of the area, showing the Leighswood Branch coming in from the top left (west side) and the many rail sidings in the area. It looks as though the branch may have connected with the Aldridge - Walsall Wood line at Leighswood. 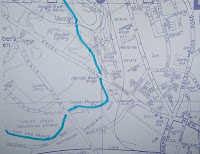 The junction for the Walsall Wood branch can be seen at bottom right of the map, near Anchor Rd at Aldridge, which was also the Aldridge Station and Goods Yard location.